Quantum Leaps is a how-to book for creating fundamental change in both ourselves and our organizations. Charlotte Shelton's basic premise is that organizational change happens one person at a time. Our workplaces simply mirror our individual and collective beliefs. Therefore, we change ourselves, our workplaces, and the world by changing our minds. As our beliefs change, we not only see the world differently, we begin to be in the world in a different way, thus creating a new reality. Shelton uses the basic principles of quantum mechanics as the foundational metaphor for a new quantum skill set that recognizes the highly complex, constantly changing, totally unpredictable nature of life. She demonstrates the inadequacy of our time-honored skills of planning, organizing, directing and controlling. She shows how these skills are directly tied to an obsolete view or reality ignoring the now fundamental requirements of extreme imagination and radical innovation. 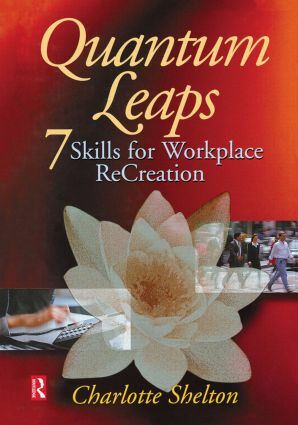 Quantum Leaps introduces seven new skills: skills that are compatible with life and work in the twenty-first century. These seven Quantum Skills enable us to see, think, feel, know, act, trust and be radically different ways. Collectively they form a comprehensive model for change. These skills integrate quantum mechanical principles, state-of-the-art-psychology, and universal spiritual practices. They balance the traditional left-brain business skills with a new skill set that more fully utilizes both hemispheres of the brain. As we master these skills, Shelton states, "We create balanced lives and whole-brain organizations and we become authentic change masters, changing ourselves and our organizations from the inside out." The Seven Quantum Skills are: Quantum Seeing, Quantum Thinking, Quantum Feeling, Quantum Knowing, Quantum Acting, Quantum Trusting and Quantum Being. These 7 skills introduce a new way to access underutilized brain capacities as they acknowledge the role of intention, intuition and interconnectivity.